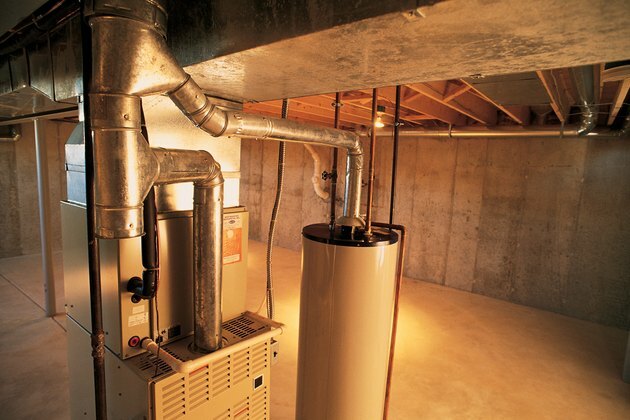 A boiler is an appliance designed to heat water and produce energy. The heat is applied to water in an enclosed container before being distributed throughout the system. The major difference between a low-pressure and a high-pressure boiler is the amount of pressure per square inch and pounds per square inch gauge that the boiler produces. Low-pressure boilers will heat a school or office building. In a low-pressure boiler the pressure does not exceed 15 psi, and hot water heating boilers are not designed to exceed over 260 psig. The temperature in a low-pressure boiler will not rise above 250 degrees F. Because these types of boilers operate at lower pressures, they don't need to be monitored regularly and only have to be checked when the appliance begins to break down. Low-pressure boilers are often used in buildings and designed to heat rooms through radiators. Types of buildings may include restaurants, hospitals, office buildings and schools. The boilers are able to heat the water used in bathrooms and use steam to heat the different rooms throughout the building, allowing them to become warm. High-pressure boilers will heat steam above 15 psi and water at pressures that exceed 160 psig. Temperatures in high-pressure boilers will exceed 250 degrees F. Because of the elevated pressure at which these boilers operate, they need to be monitored to ensure safety at all times. High-pressure boiler operators must inspect switches, valves, safety devices and leaks on a regular basis. Any malfunctions need to be fixed immediately to prevent further damage from occurring. High-pressure boilers are used in industries and designed to generate the steam found in power plants, dry cleaners and laundromats. These boilers were also used in locomotive steam engines to give them the necessary power to run. Individuals who maintain these boilers need to follow certain precautions to avoid burns, shocks and other hazardous conditions.